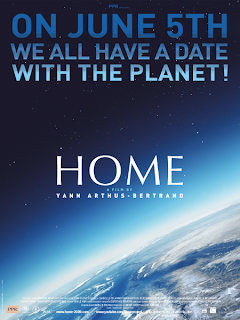 Quote Home, the new environmental film by Yann Arthus-Bertrand which I just watched. The film is available for free on YouTube for some time and I'd generally recommend it. Rather than detailing one or a couple of issues or projects this is a "big picture" approach that starts out explaining how life came to be on the piece of rock we call Earth and how we have disrupted this phenomenal emergence of an ecosystem. A fine educational movie with plenty of slow motion bird perspective scenery. To the average ecologist it's a bit romantic at times - which will probably also turn-off the typical in-denial fossil fuel lover. The scenery - of both nature and civilization - is at many times throughout the film so beautiful I'd like to see it again in an IMAX cinema. If it is shown in Copenhagen I'd try and drag along some friends. Because more people need to see this. Unfortunately, in my opinion, it would have benefited from a pinch of simple chemical formulas to nail home the carbon cycle disruption point. The quote I put at the top of this page is of course mostly a thought provoker. We can't reverse the situation just like that, but it's a healthy little fantasy to think of. And it underlines the fact that we increasingly protect the resources we have with costly force rather than make efforts to help others sustain themselves. Home does not mention wars or conflicts except indirectly like in the quote. But as it illustrates a wide range of issues - lack of water, deforestation, climate change, you name it - and how they are connected it isn't exactly a quantum leap to see it's subject in relation to possible conflicts. The finishing quarter of an hour is a "positive" segment. We get to see gigantic windmill and solar cell parks, ocean wave harvesting "snakes" and more. Free rice is a little English vocabulary game that makes you score and donate grains of rice for the hungry by each correct word. Or study, interact and support the UN World Food Programme Students And Teachers section. People who are not starving are less likely to go out and exploit more of our dwindling resources or fight each other over spoils. That's not rocket science. Regarding "military expenditures" Jun 8th The Economist published a telling statistics "Military spending: Arming up". Hi Benno, thanks for helping me spread the word legitimately. keep up the great work and may continue to always be the type of blogger that you are! :) A presto!